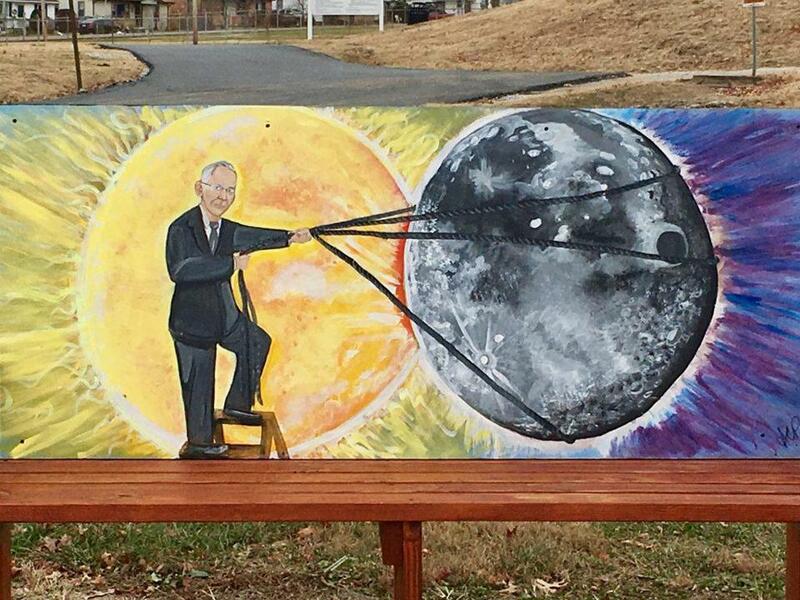 A bench outside in Hopkinsville, Ky., depicted local mystic Edgar Cayce lassoing the moon. Hopkinsville, which is near the point where the total eclipse will last the longest, is in Christian County, where 63.9 percent of voters cast their ballots for Donald Trump last year. Is the eclipse throwing shade at Clinton supporters? The path of ideal viewing spots for this month’s highly-anticipated total solar eclipse cuts overwhelmingly through places that voted for President Trump in November. There are about 240 counties roughly along the central path of the eclipse, a 70-mile-wide trail extending across the country where people will be able to see a total eclipse, meaning the sun will appear completely obscured by the moon. And about 92 percent of those counties swung in Trump’s favor, while fewer than two dozen counties voted for his opponent, Hillary Clinton. Trump won many of those counties by a wide margin, securing an average of 71 percent of the vote in counties he won along the path. Clinton, by comparison, got only about 56 percent of the vote in counties she won along the eclipse path. And of the more than 6.2 million votes cast in those counties for one of those two candidates, 59 percent were for Trump, while 41 percent were for Clinton. That stands in stark contrast to the overall results of the 2016 election, in which about 51 percent of votes cast for either candidate went to Clinton, while about 49 percent went to Trump. Even Clinton voted for Trump — Clinton, Mo., that is. The county lies right along the heart of the total eclipse’s path, and 69.2 percent of voters there cast their ballot for Trump. The eclipse on Aug. 21 will be visible to people across the United States, but in most areas, the view will be of a partial eclipse. People will only be able to see a total eclipse if they’re located along the “path of totality,” which will start near Lincoln City, Ore., and end near Charleston, S.C. 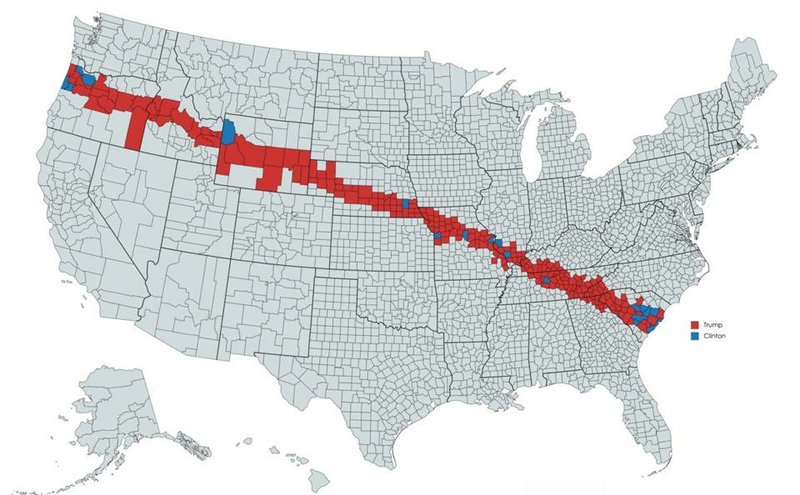 Still, it’s not entirely surprising that the eclipse’s path of best perspective could slice through the entire country while mostly avoiding areas that backed Clinton. While she won the popular vote, Trump won the Electoral College and about 84 percent of the country’s 3,100-plus counties. Clinton won more voters overall because she captured densely populated urban areas, including New York City, Los Angeles, and Boston. Trump, by contrast, won many rural areas with small populations. Perhaps it’s not a surprise that the solar eclipse is passing over Trump strongholds given that the president himself was born during a lunar eclipse. On June 14, 1946, the day Trump was born, there was a total lunar eclipse, though it wasn’t visible from the United States, NASA records show. Instead, it could be seen from parts of South America, Europe, Africa, Asia, and Australia. The highlighted counties show, roughly, the path along which people will have the best views of the Aug. 21 total solar eclipse. Counties shaded red voted for Trump; those in blue voted for Clinton.